Clu Clu Land is a puzzle game released for the Famicom on November 22, 1984 and for the NES on October 18, 1985. A Nintendo Vs. System version of this game was also released. 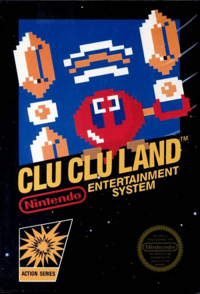 An enhanced version of this game, Clu Clu Land D was later released for the Famicom Disk System in Japan. In Clu Clu Land, the player plays as Bubbles, a female Bubble fish and protagonist of this game. The plot of this game is where a Sea Urchin, called Unira, is stealing all the treasures in the underwater kingdom of Clu Clu Land. Bubbles is set out to retrieve all the stolen treasures from the Unira. The object of every level is to uncover all the gold ingots in every level while avoiding Unira and Black Holes. There is no way to stop Bubbles from running continuously in a straight line, so the only way for her to turn around into a different direction is by means of turning points located in all levels. The only way to defeat Unira is if the player uses Bubble's sound waves. Once used on Unira, Unira will get stunned. Once stunned, Bubbles can push Unira into a wall and then Unira is destroyed and the player gets a point. If Bubbles touches a Unira if it's not stunned, the player loses a life. Like every other game that has lifes, it's game over when Bubbles loses all of her lifes. In later levels, the player must pass over the ingots an odd number of times to uncover them, as they will alternate between their uncovered side and a dull side. In Super Smash Bros. Melee, Bubbles appears as a trophy and later in Super Smash Bros. Brawl, Unira appears as an item. Unira once again appears as an Item in Super Smash Bros. 4. The rupee from The Legend of Zelda series was modeled after the Ingot sprite from Clu Clu Land. This page was last edited on 23 March 2019, at 17:25.